Ask anyone what the biggest concern about their cars and tools is and the word rust is bound to come up often. Rust is unrelenting and there a hundreds of products on the market to prevent or slow its ever-present march of destruction. The problem is that once it starts, it is difficult to stop. 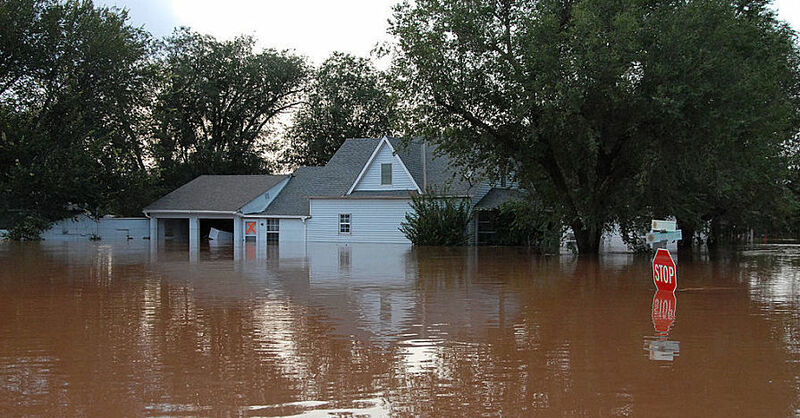 The most common solution is mechanical removal, which means sanding or grinding it off. 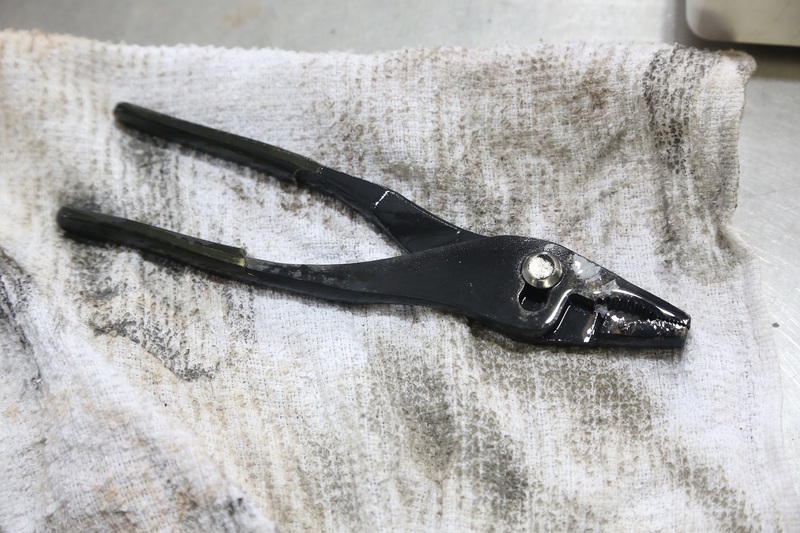 This is fine for parts or tools being restored, but things that not so easily repaired such as chrome parts, tools, rare parts, and other items that just have a little rust starting to form. 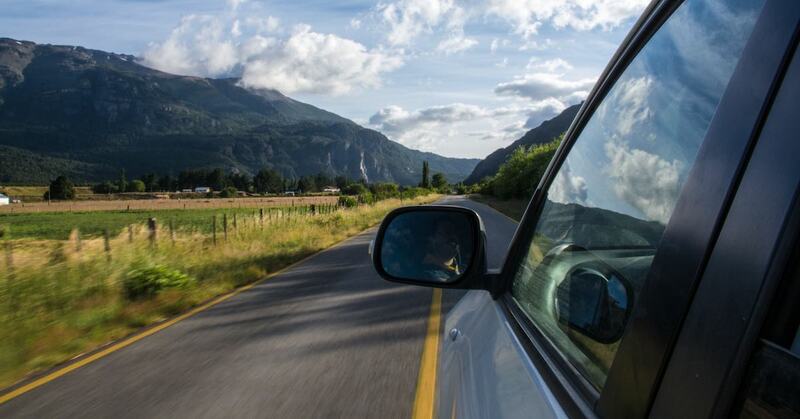 You need a better solution to remove the rust and leave the chrome or paint untouched. Enter WD-40 Rust Remover Soak. This 100% non-toxic and biodegradable formula eats away the rust, leaving behind clean bare metal, which can then be treated to prevent future rust. It is safe for gaskets, chrome, and painted surfaces, all while being non-flammable and 50-state compliant, making this water-based solution perfect for anyone who faces the epidemic of rust. 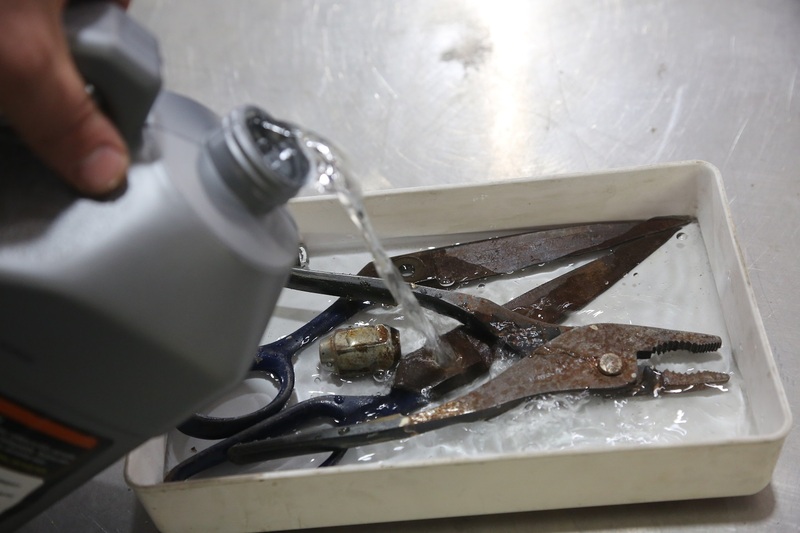 When you have rusty tools and parts, their performance is reduced. 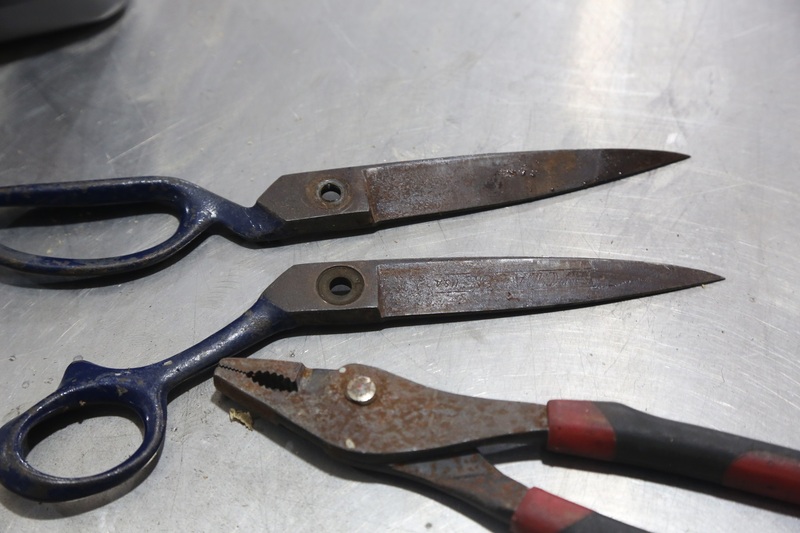 Pliers stick, and scissors leave rust dust all over upholstery. Time to fix it. 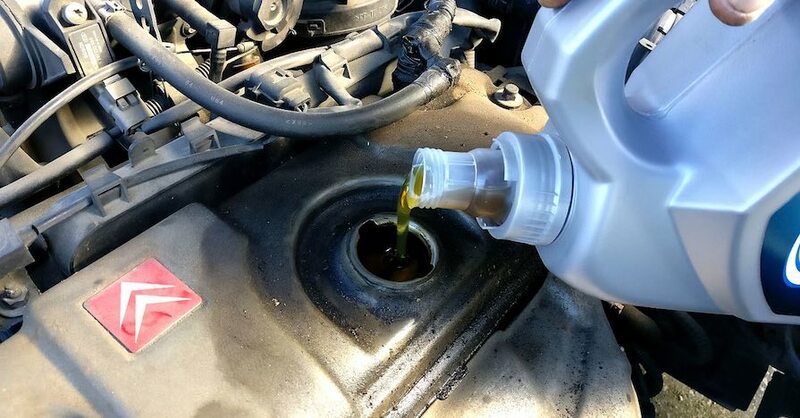 Using WD-40 Rust Remover Soak is easy, you just need to follow a few basic rules to ensure that the product gets the job done quickly and effectively. 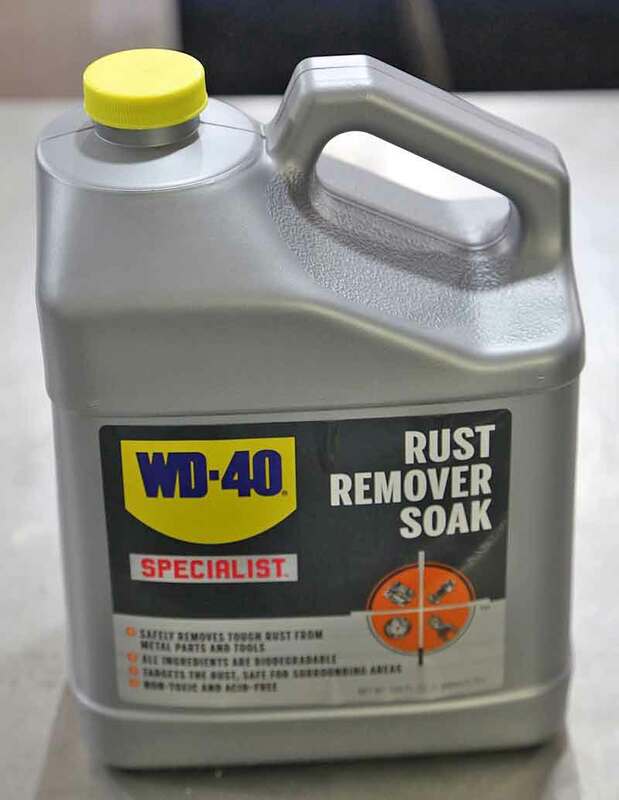 WD-40 Rust Remover Soak is reusable several times, so don’t worry about wasting the product. Used solution should be kept separate from unused solution, so don’t pour any used solution back into the bottle, simply store any used solution is a separate sealed container for future use. Once the solution becomes dark black, the effectiveness decreases and should be disposed of according to your local guidelines. Prep the part or tool to be treated by removing any dirty, grease, oil, and loose debris with a detergent or degreaser. WD-40 Rust Remover Soak is most effective on clean metal. 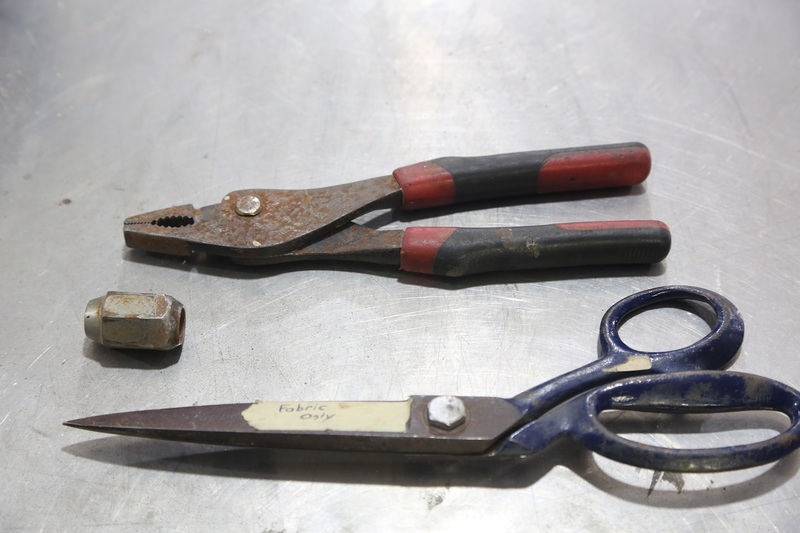 We prepped the tools by taking them apart. 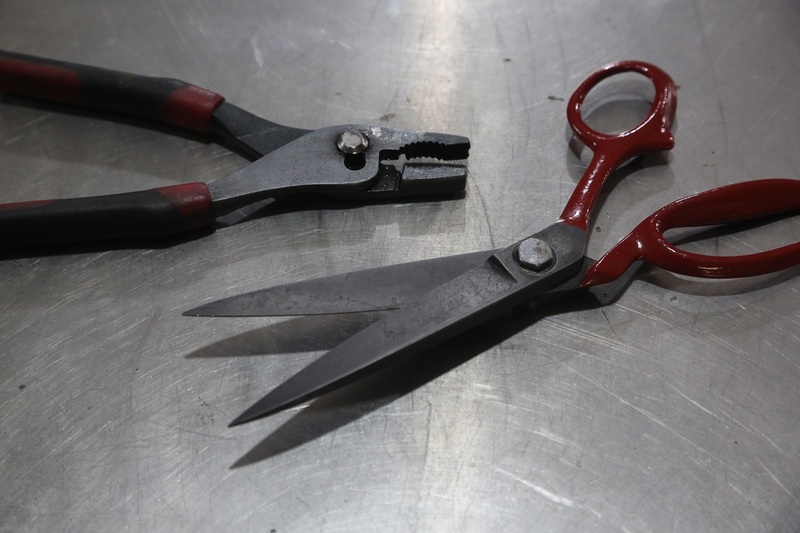 The scissors simply unbolted, but the pliers cannot be separated, we just removed the rubber handles. 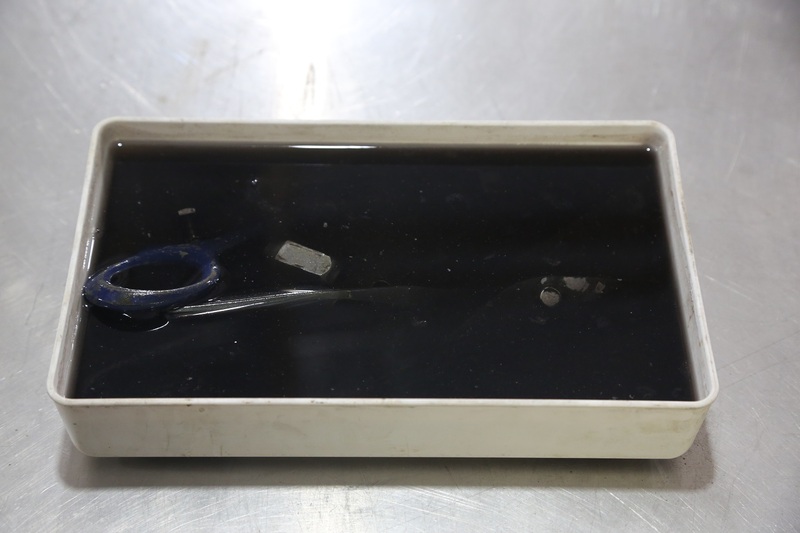 Fill a container that will hold the part(s) with enough soak to fully submerged it. WD-40 Rust Remover Soak comes in 1-gallon jugs and is available in a four pack. Do not dilute the solution. 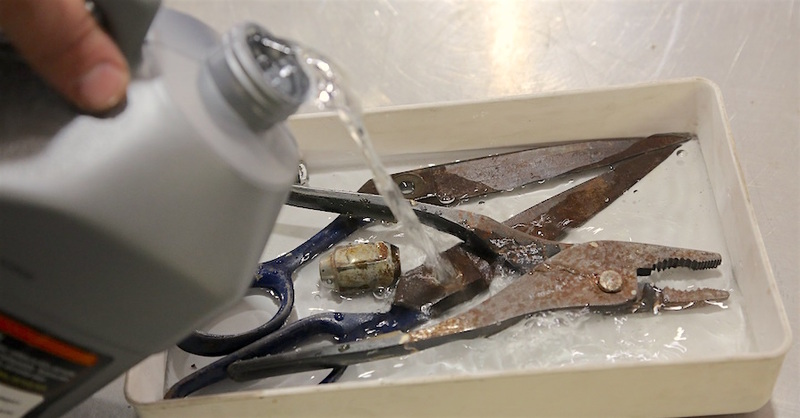 The tools were placed in a plastic tray and covered with just enough WD-40 Rust Remover Soak to cover the rusty bits. Then we left it to soak overnight. Place the item into the soak. How long it needs to be in the solution depends on the amount of rust. Light rust will be removed in as little as 30 minutes, while heavy rust scale can take 24 hours. The longer you leave the parts in the soak, the darker the liquid becomes. When it is black, the performance decreases. Once the rust is gone, the part needs to be rinsed and dried off completely. If there is rust remaining on the part, such as inside the pitted areas of heavily rusted items, re-soak and repeat the process. Each part was removed and cleaned and dried. 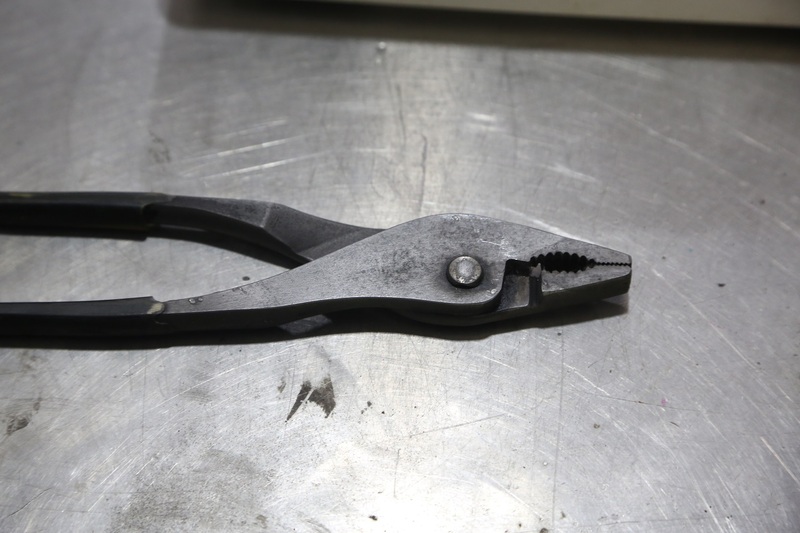 The pliers are rust-free now. If we don’t protect the bare metal, they will just rust again. 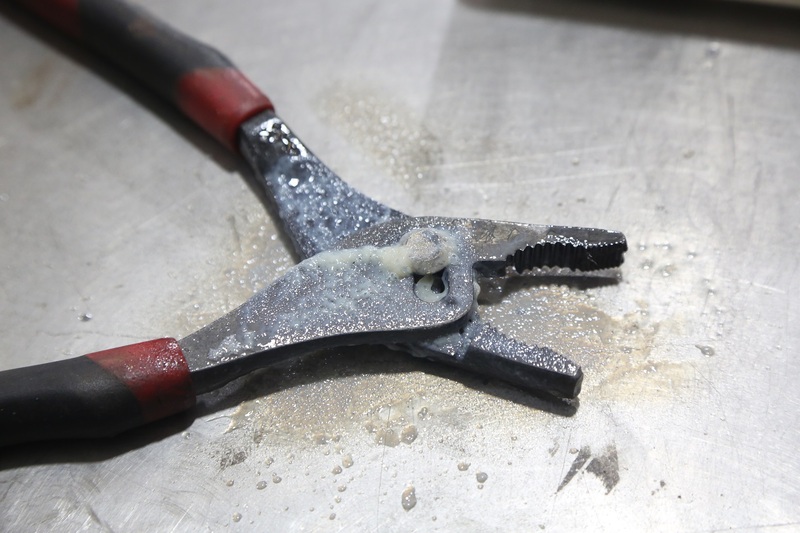 Now that your parts or tools are rust free, you need to protect them. The rusted areas are bare metal, there is nothing to stop the rust from coming back, which can happen overnight. 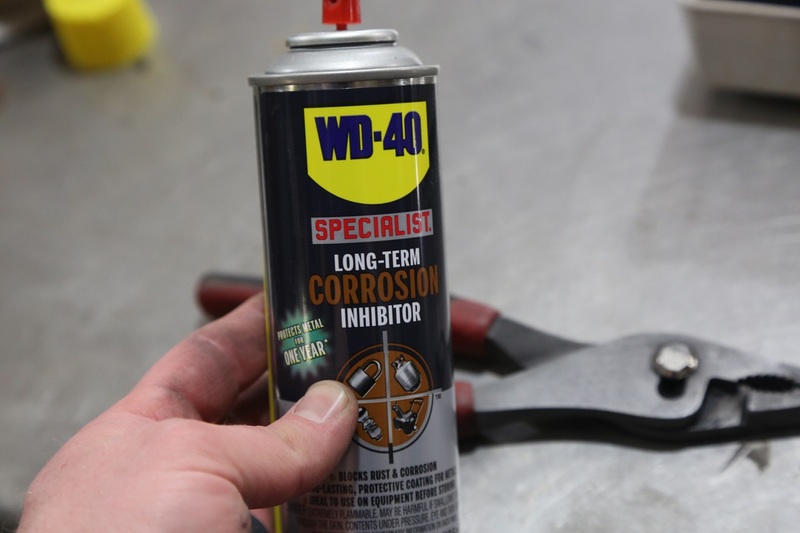 To protect your cleaned parts, spray them with WD-40 Original Formula for flash rust protection, or for long-term protection, use WD-40 Specialist Long-Term Corrosion Inhibitor. 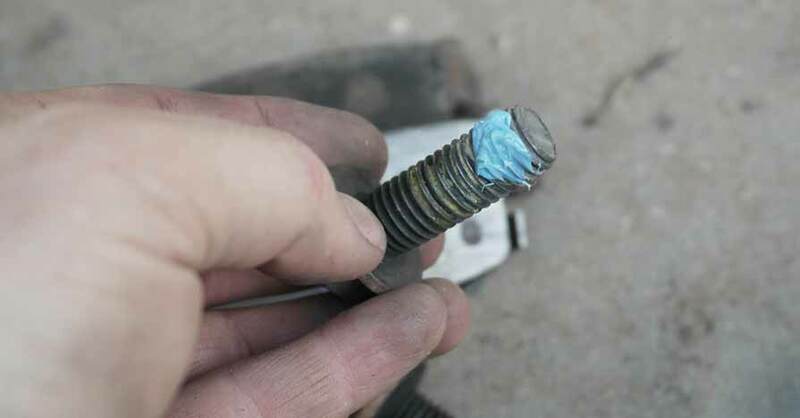 For painted parts, you can always simple repair with matching paint. We used WD-40 Long-Term Rust Inhibitor to seal the metal so that it won’t rust up. This stuff goes on pretty heavy, we wiped it down so that it doesn’t get all over the parts we are working on. Rust is no fun, and often we just let it slowly eat away at our tools because it so hard to combat. WD-40 Rust Remover Soak is your new best friend in the battle against rust. Check out all the chemical products available on NAPA Online or trust one of our 16,000 NAPA AutoCare locations for routine maintenance and repairs. For more information on WD-40 Rust Remover Soak, chat with a knowledgeable expert at your local NAPA AUTO PARTS store.